You may recall my review of the first book in this series, Dorothy Must Die. You can check out that review to get a bit of an overview of the story, but in short, Amy Gumm is the other girl from Kansas. She is swept away to Oz in a tornado, and she has a mission: "Remove the Tin Woodman's heart. Steal the Scarecrow's brain. Take the Lion's courage. Then and only then—Dorothy must die." (taken from GoodReads) At the end of the story (no spoilers really, don't worry), Dorothy is still alive, and the story continues in The Wicked Will Rise. Amy Gumm is still in Oz, still having her mission to complete. Not all went as planned for Amy, and now she must figure out not only who she is in Oz, but find her friend on a lost island, understand the ways of the wingless monkeys, try and figure out if the Princess Ozma is actually stark-raving-mad or speaking profound truth. As she continues to battle against the forces of Good (which are actually evil), and work with the Revolutionary Order of the Wicked (who are mostly good), to restore Oz to how it should really be, Amy must also come to discover the person that Oz is turning her into, who it is making her to be...and if she really wants to be that person. 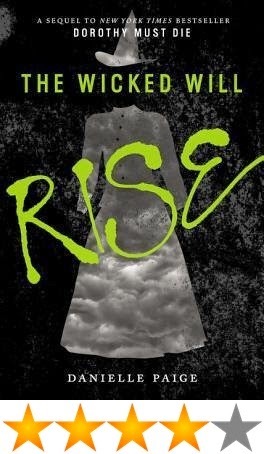 With action and mystery, magic and all the things we love about Oz, The Wicked Will Rise is a great sequel to Dorothy Must Die. Like the first book, the characters are brilliant and so creative.The new characters that are introduced in this book have their own flare and personalities that make you want to smile, and sometimes cringe. In The Wicked Will Rise, we're introduced, too, to more of Oz and the magical lands that it has. I really love the imagination of Paige and the world that she has re-imagined from the story we all know and love. What did disappoint me a little was the length. At less than 300 pages, it was a decent amount shorter than it's predecessor (by over 100 pages), and while I love a short book, I feel like another element could have been thrown in to make it even a tad longer. However, I really did enjoy it and I'm looking forward to the next book, which I believe doesn't come out until next year, possibly even 2017.